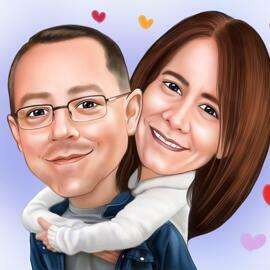 Purchase a cute Sketch Caricature, hand-drawn from photographs, in monochrome pencils style. Original Pencil Caricature of a woman will be a perfect gift idea on Mother's Day as well as on Birthday and Valentine's Day. Pencil Caricatures are created with a high quality, based on your ideas and skills of Photolamus team indeed. Black and White Sketch opens brilliantly the most beautiful facial lines, the shading of the face in the best perspective. If you would like to get a caricature of your girlfriend, wife,mother, godmother or any other woman who has contributed in your life, then we can create a memorable caricature gift in a week. Ordering is simple. Upload the most beautiful photo and mention some of ideas and demands in the requirements box below and we will make an awesome caricature of your person. Pencil Caricature will be scanned and delivered as a high resolution JPG File to your Email, by default. Caricature can be printed on any surface of your choice. We offer you additional delivery options at extra cost: Original Caricature drawn on A4, A3 Paper, Pencil Caricature printed on Canvas or Photo Paper of multiple sizes. Worldwide shipping is available.